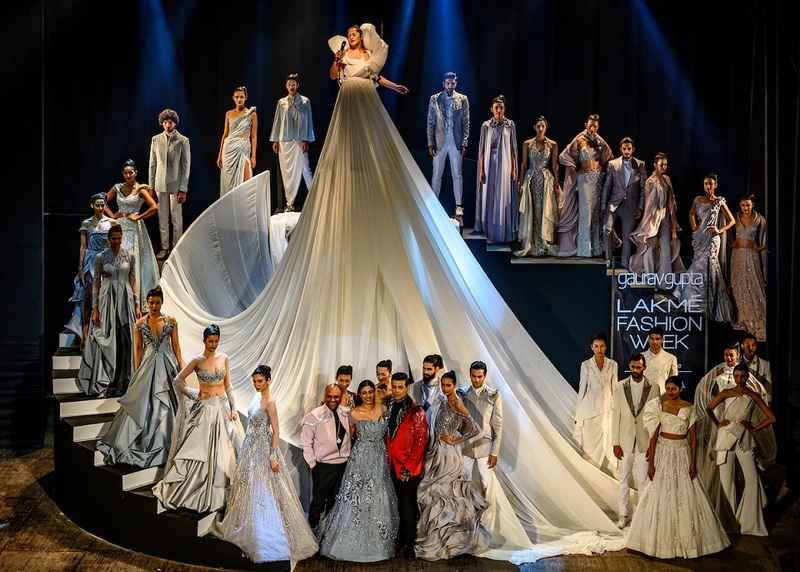 Day 1 of Lakmé Fashion Week began, as usual, with the Gen Next show which was preceded by Gaurav Gupta’s opening show the previous night. 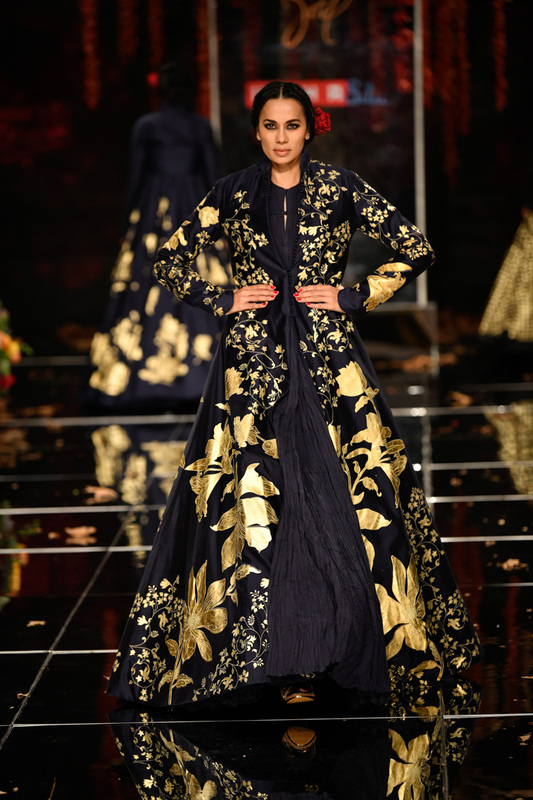 The designer’s larger-than-life eclecticism was brought alive at Royal Opera House through Navkirat Sodhi’s (a.k.a The Poetresse) verses with Tabu and Karan Johar playing muse. 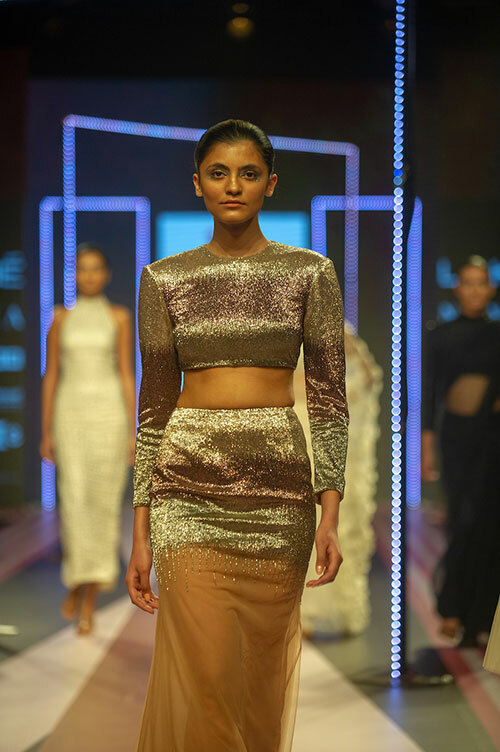 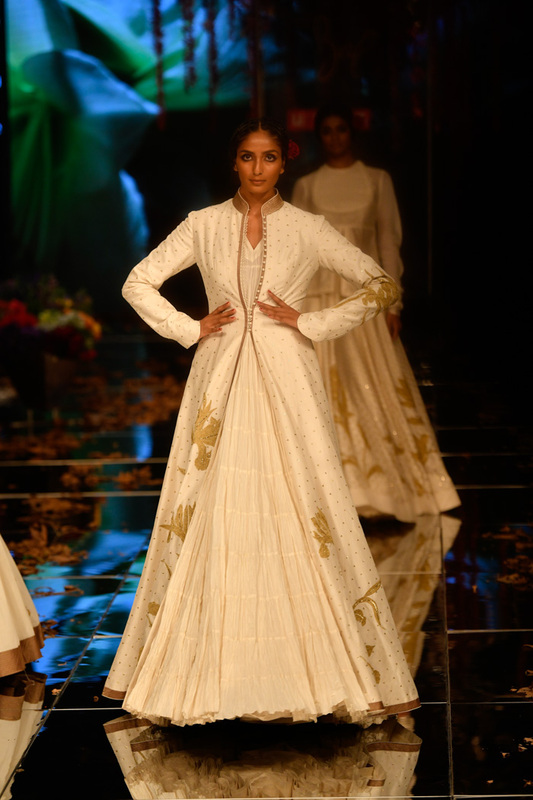 It was a lavish affair made grander by the visual elements — in keeping with the trend of Indian designers paying as much attention to presentation as they do their designs. 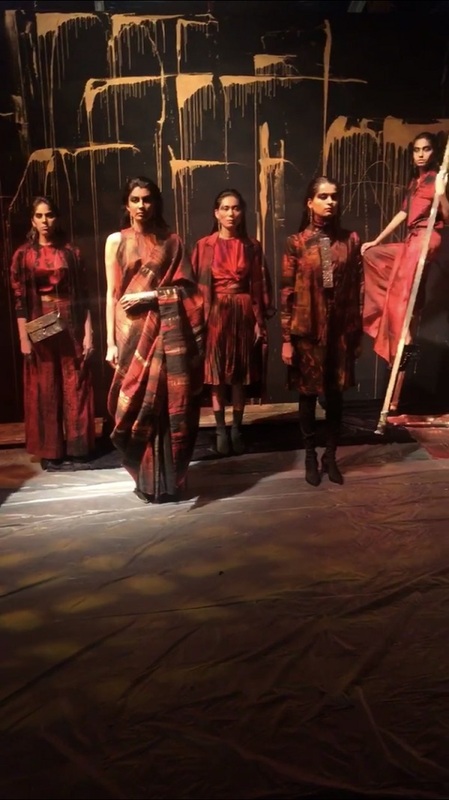 This was further highlighted during Helena Bajaj Larsen’s installation at the Studio area yesterday where fiery orange coalesced with midnight black on ensembles that looked like dragons were wreaking havoc against an inky sky. 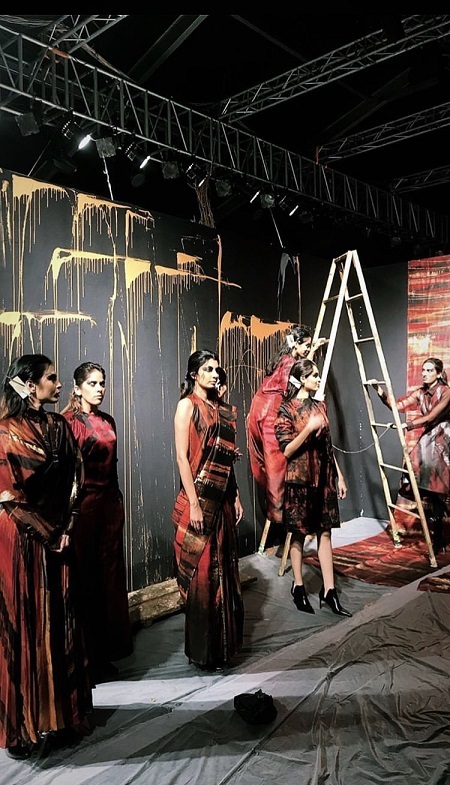 The designer herself chose to be part of the motley crew of models where she languorously went about adding brushstrokes to a large artwork made of fabric in the background. 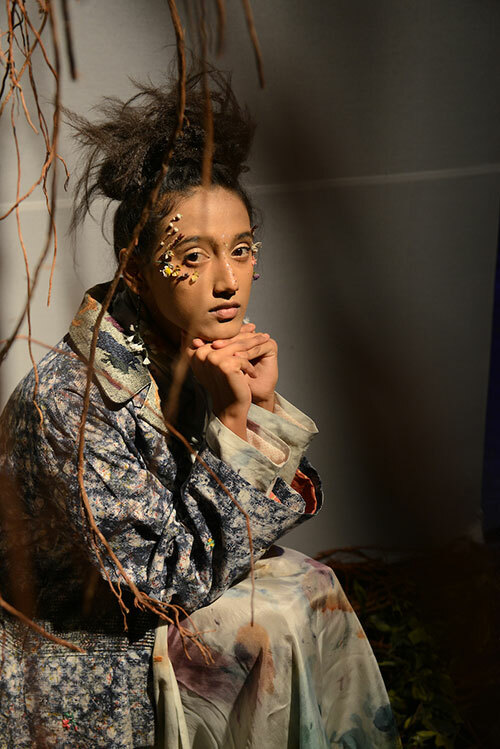 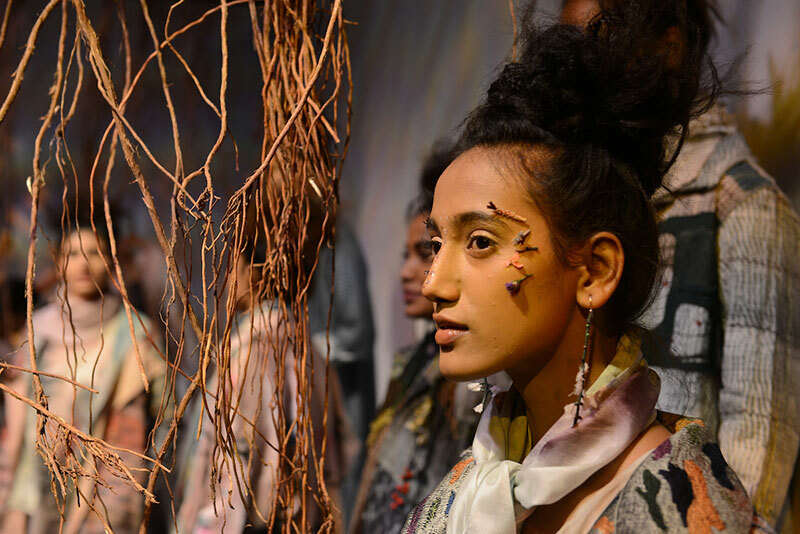 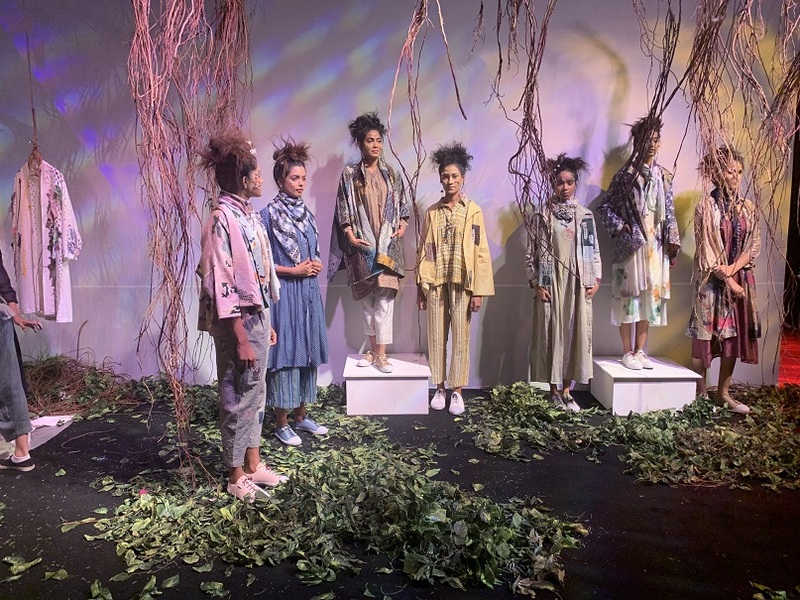 Ditto for Yavï’s set which looked like an enchanted forest from a time long gone with models sporting tiny flowers on their faces while designer Yadvi Agarwal casually walked around painting found objects on a canvas behind them. 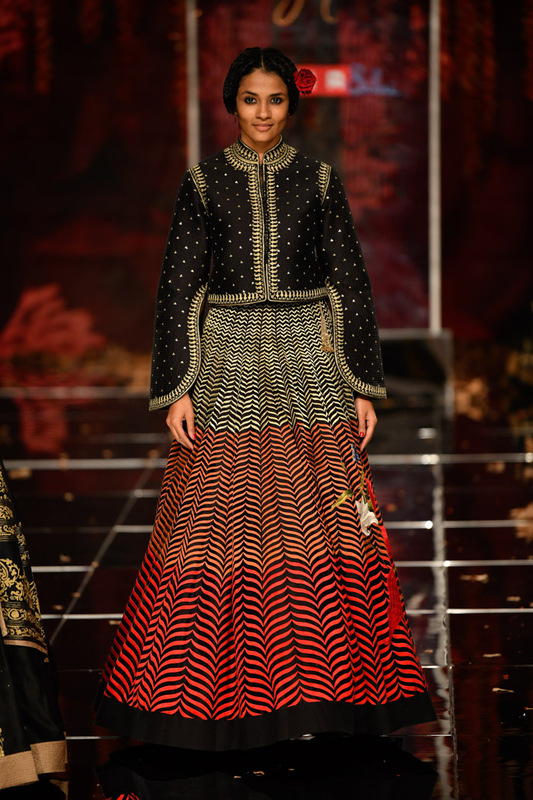 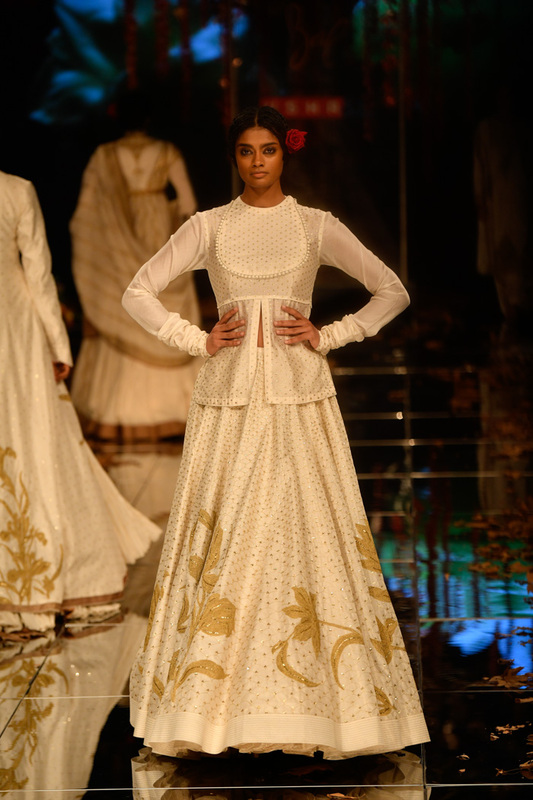 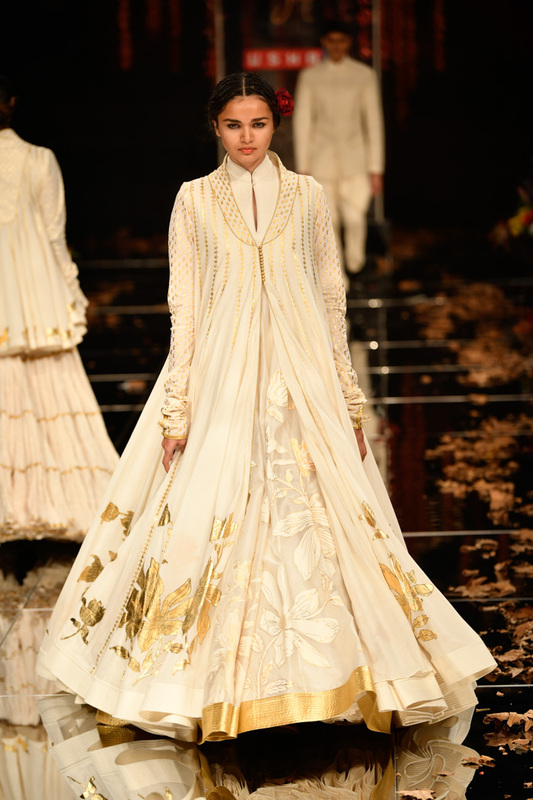 But the most delightful sensorial experience from last night came about during the final show by Rohit Bal. 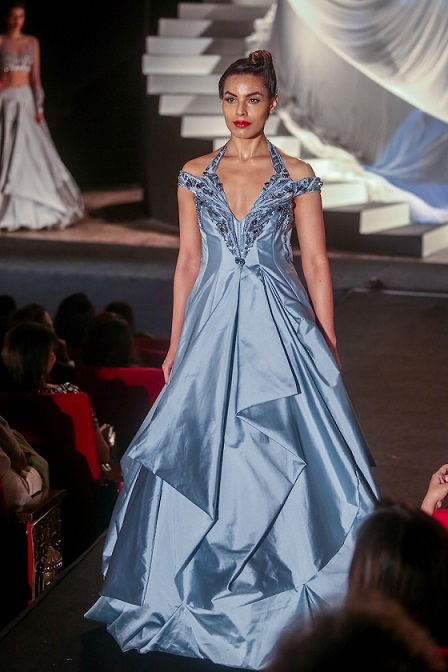 Guests who were ushered in before the show started would have been privy to the designer rushing about trying to get things in order at the last minute. 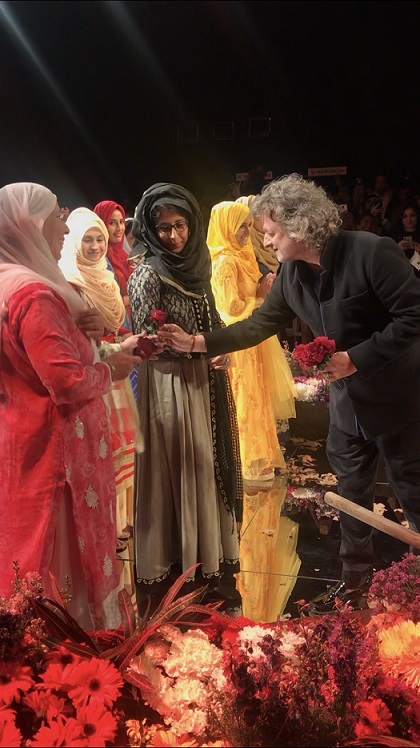 The stage was designed to look like a mini version of Kashmir complete with flower-laden shikaras lining the runway and a chinar tree surrounded by sewing machines since this was an initiative with the Kashmiri cluster from Usha Silai. 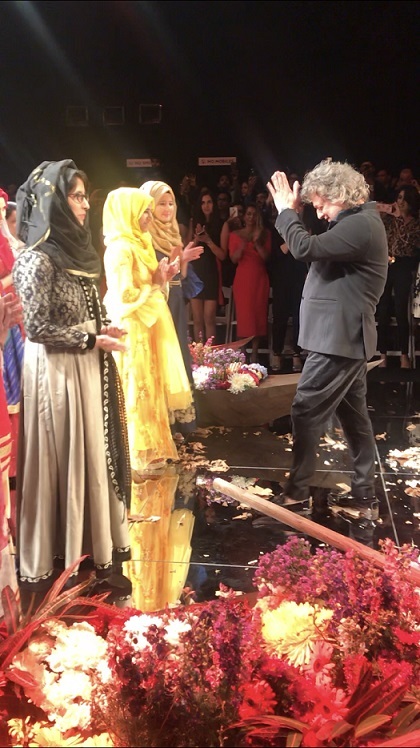 Just before the guests were scheduled to enter, Bal impulsively grabbed a cardboard box filled with chinar leaves and went around the runway strewing handfuls of them. 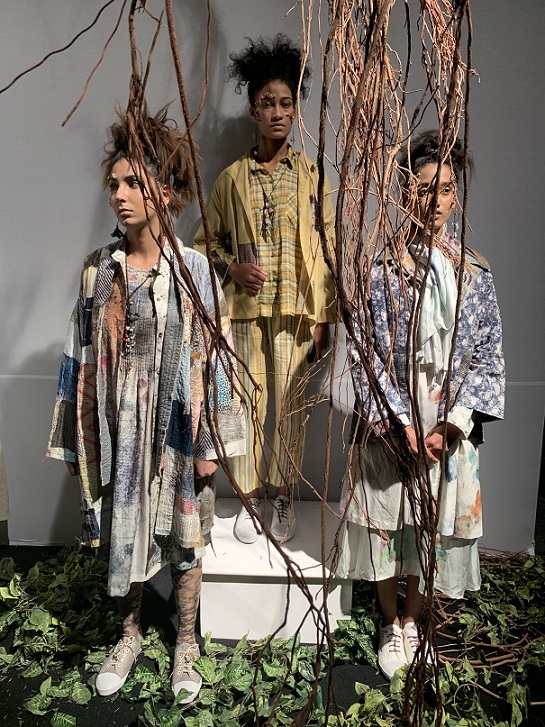 You see, he could’ve asked one of the volunteers to do this for him; there were at least a dozen of them barely 5 metres from him. 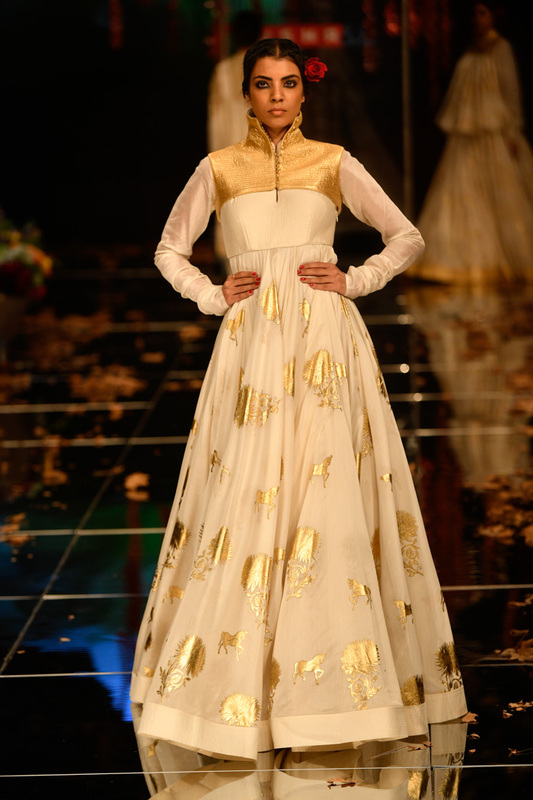 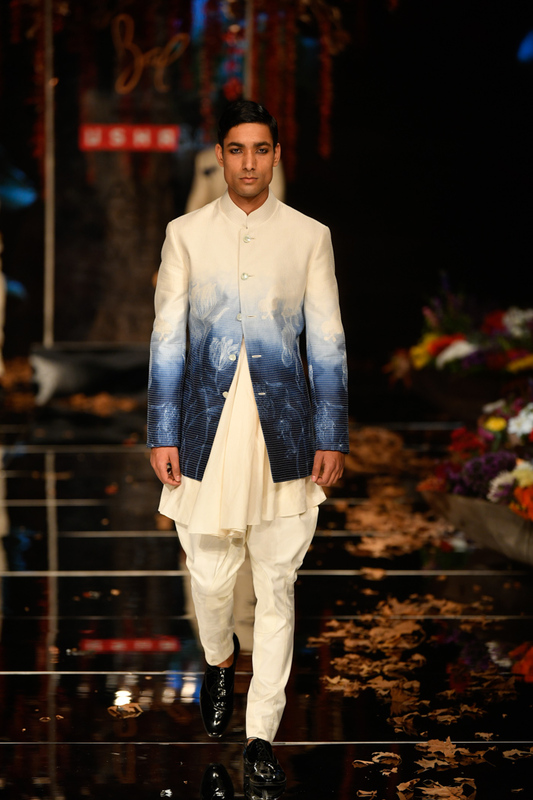 For the designer, however, this was an homage to his hometown of Kashmir; one that he would have to pay himself, which is why the sprinkling of leaves had a very symbolic feel to it. 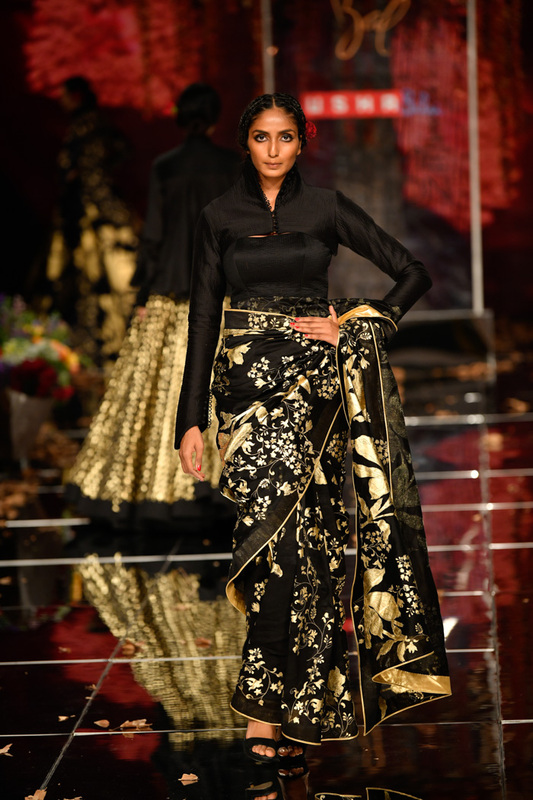 And Bal didn’t rush this exercise even though the show was running late. 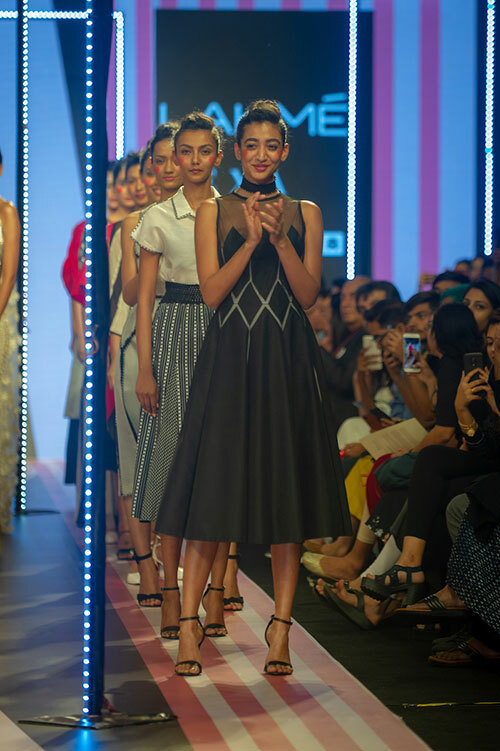 He did it leisurely and lovingly and only when he was completely satisfied with his handiwork did he retreat, but not to the backstage area where designers usually watch their shows from. 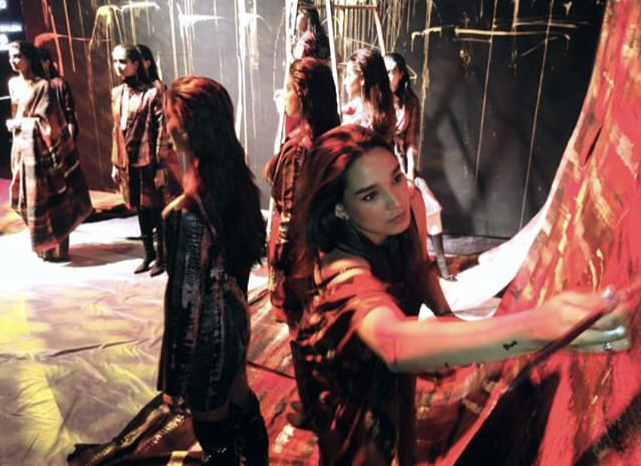 No, the designer wanted to experience his own show just like his viewers would and so he stood at the beginning of the front row. 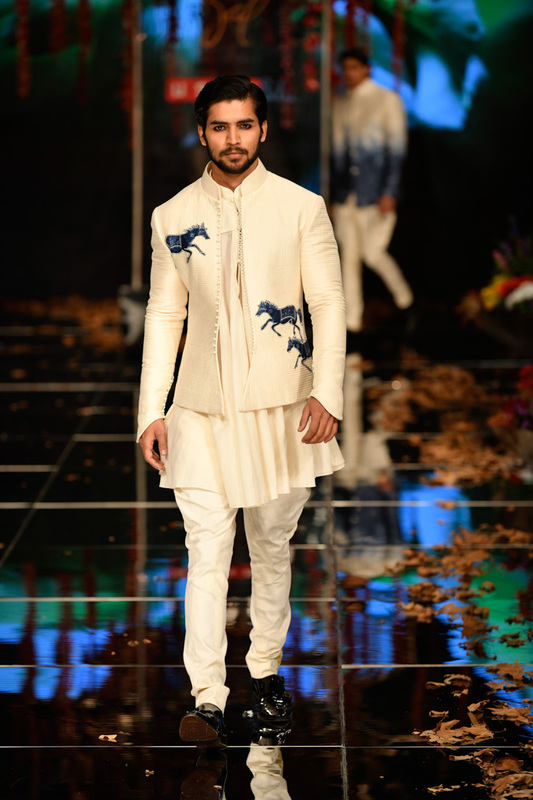 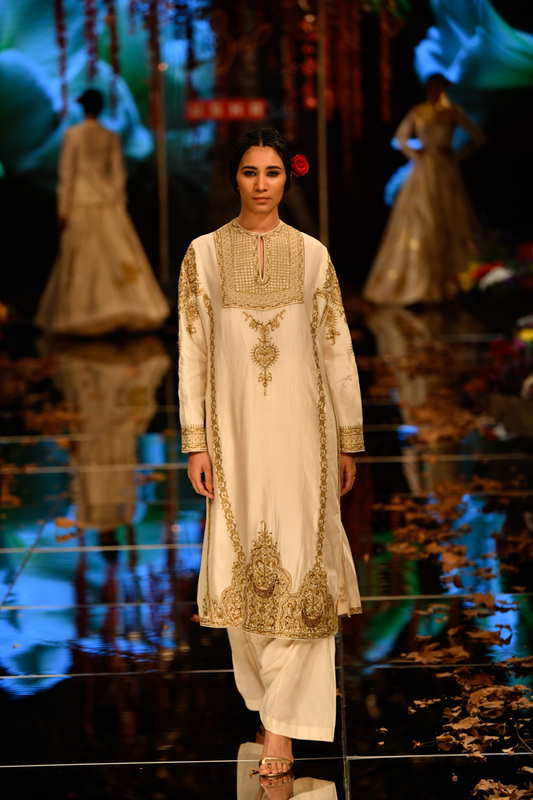 The models came out in full Kashmiri regalia, the women garbed in flared kurtas, stately jackets, ornate capes and tiny quilted boleros; the men in indigo bundgala jackets interspersed with galloping horse motifs. 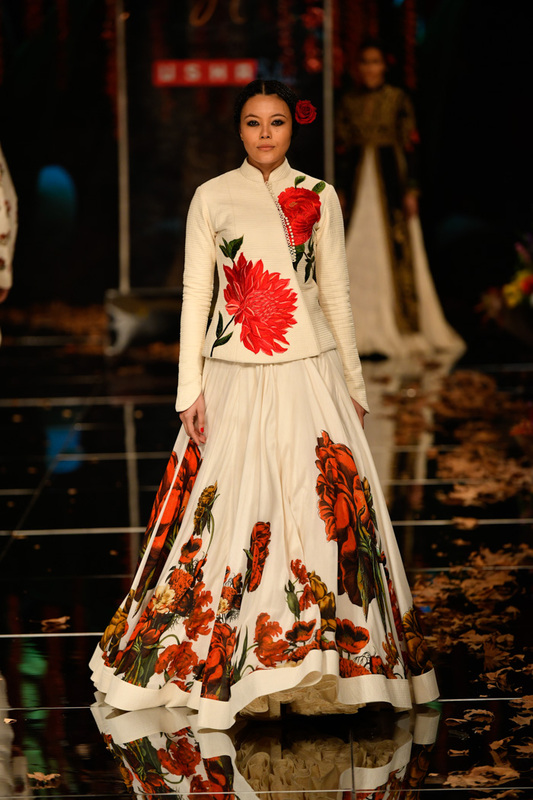 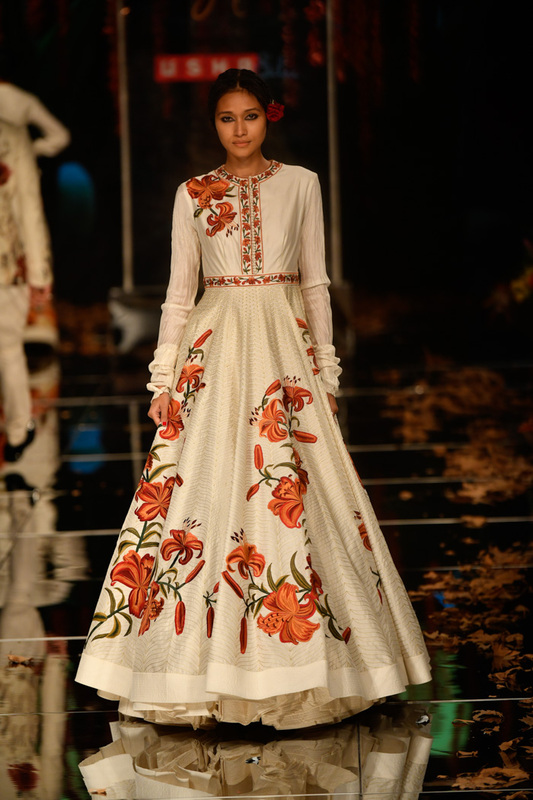 Guldastah, as his collection was appropriately named, moved from a colour palette of ivory to black with complex botanical paintings of sunflowers, poppies, tulips and peonies adorning them. 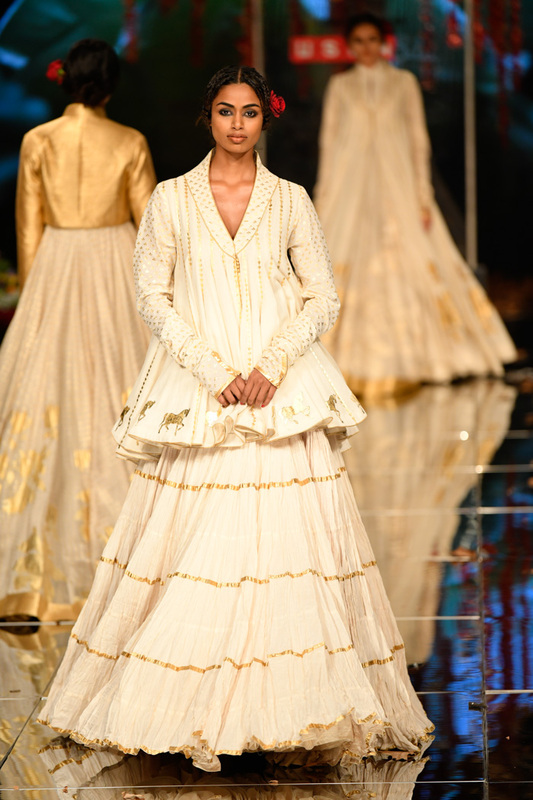 Tunes from yesteryear like Baahon Mein Chale Aao and In Ankhon Ki Masti Ke resounded through the room and guests couldn’t help but look back and forth between the models on the stage and the designer in the aisle as he stood transfixed through the duration of the show. 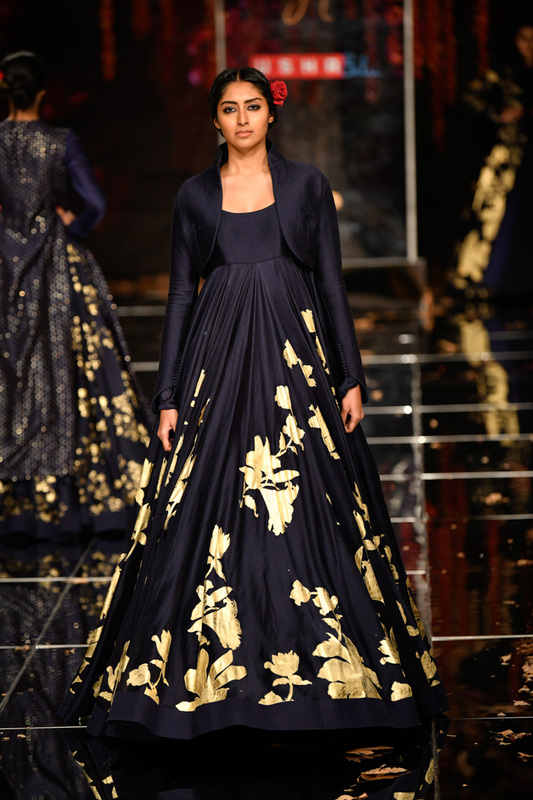 And while the clothes were a sight to behold, Bal’s designs were not the show-stealing moment of the show. 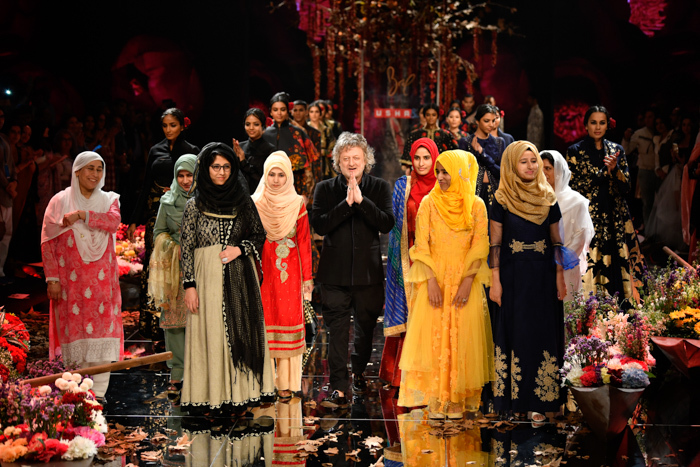 After the final walk-through of all the models, the designer walked on to the stage and invited the women from Usha Silai’s Kashmiri cluster to join him, presenting each one of them with a rose while joining his hands reverently in front of them. 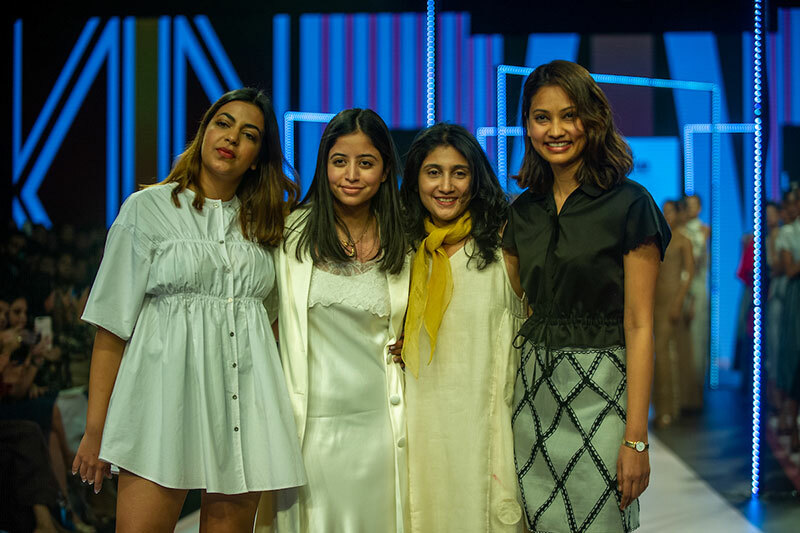 In the face of Kashmir’s current political situations where civil conflicts and local skirmishes are a part of daily life, it was heartwarming to watch these ladies present a part of their country that is untouched and unmarred by war.